The teen who organized a bike ride of over a 100 kids, teens, and adults along I-676 last month in celebration of his birthday has been sentenced to probation. The now 17-years-old prominent Philadelphia BMX rider, "One Way" Corey Murray, used his prolific Instagram account to invite riders to join a rideout on April 23rd. He had 95,000 followers at the time, now up to 98,000. 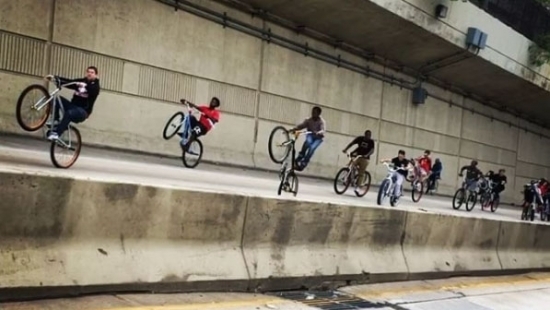 The large group of bicyclists ventured onto the Vine Street Expressway blocking traffic, pulling stunts and popping wheelies along the highway before dispersing. Pennsylvania State Police eventually arrested and charged Murray with disorderly conduct. According to his lawyer, Murray signed a consent agreement before a special master in Philadelphia juvenile court today. After six months probation his record will be expunged. He must also complete community service. Murray was the only one arrested. Four Philadelphia eighth grade students and one teacher remain in the hospital on Tuesday following a charter bus crash on I-95 in Maryland on Monday morning. The bus was carrying 30 people, 26 of whom were students, from the Charles W. Henry School in Mount Airy to Washington D.C. for a class field trip. The bus was clipped by another driver and flipped over. All 30 occupants were injured and taken to the hospital, but most have been released. One student and the teacher remain in critical condition. School is closed today for Primary Day, but counselors will be available to students again on Wednesday when classes resume. Authorities have ruled that arson was the cause of a fire that destroyed a two-story home and several nearby parked cars in New Jersey early this morning. It happened around 4:30 a.m. on the 400 block of Hamilton Road in Glassboro, NJ. The Gloucester County Prosecutor's Office said that investigators determined the fire was intentionally set. The blaze spread to several parked cars and started brush fires in the area before firefighters brought it under control. There were no reported injuries. Investigators are still trying to determine a motive. No arrests have been made. An eyewitness caught the intense fire on video. Watch it below. Watch on #Periscope: Fire with entrapment glassboro nj https://t.co/4hF9Veql6F. @SDNVtv one for you to watch from me.